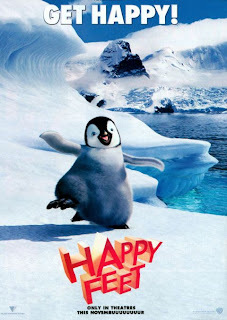 It was very fun watching Happy Feet with KC. It isn’t just a film for little children and it’s not just a plain film for entertainment. Underneath the pretty colors and comedic elements of the film are universal lessons and truths that we people tend to forget. First. Let us protect the environment. We may be the smartest creatures on earth, but one reason for this intelligence is to safeguard the existence of every living creature here on earth. We only have one planet, one home, that is why it is so ironic to know that we are destroying this home. Second. Just like in several films, Happy Feet embraces the quality of man as being unique and precious. People fear and even hate other people because they are different. That is why they treat these people badly and even to the point of hurting these people. They tag these different people as monsters, but what they don’t know is that these different people only become monsters because of the way people are treating them. Third. Man is not finite. Man has many possibilities. People do change and sometimes for the better. We might call someone a loser but we may have to eat these words in the future because the person we called loser happened to be come a great somebody. Just like in Happy Feet. Mumble was different and they branded him as queer because he couldn’t sing and he could only dance. But this dancing that the elder penguins labeled as nonsense was the one that saved them all.